Whenever a property in Thailand is bought or sold three taxes have to be paid. Many buyers (especially foreigners) fail to take these into account. It should be decided beforehand whether the buyer or seller will be responsible for paying these. Because of the peculiar local system of taxing property on an arbitrary assessed value as determined by the Land Department rather than true market value, these taxes could amount to a considerable percentage of the purchase price. First there is a property sales tax of 0.11% of assessed value or the sale price whichever is higher, as well as a transfer fee of 0.01% of the assessed value of the land. Also a stamp fee of 0.5% of the assessed value or the sale price - again, whichever is higher. * The seller has owned the property for at least five years. * The seller has used the property as his primary residence for at least one year prior to the sale. * The seller received the property as an inheritance. If you haven’t determined during the negotiations that the seller will pay the taxes upon transfer, you could get a nasty shock when a tax bill arrives - often some two or three months after the sale is completed - since the seller often neglects to mention this liability. (And after all, why should they tell you if you don’t already know or ask? As in all business transactions anywhere, caveat emptor is the rule: Let the buyer beware). Once you have acquired property, you must pay property taxes on it. If you rent out the property, the tax is 12.5% per year on the annual rental revenue. (Which is why so many local rentors want the lessee to pay tax for them, as they don’t want to lose 12.5% of their revenue). There is also a tax on non-rental property. This depends on location and land classification, and varies from 0.025% to 0.095% a year. In addition, if the house is purchased through a company, one has to bear in mind that corporate tax is higher than personal tax, and the cost of setting up the company has to be considered as part of the initial investment outlay, even if this is a relatively modest additional cost - perhaps around US$1,000 all told. Then, when you want to sell the property, it is simply a matter of transferring the shares of the holding company to the buyer, without the necessity of re-registering the land titles. There are of course costs and fees involved in this exercise, but typically only a few thousand baht all told. Again, get a professional business representative or lawyer to do it all for you. Selling a property ‘naked’ (i.e., without a company ‘wrapper’), you may be liable for all of the fees that were applicable at the time of purchase (see above). You would also have to pay income tax on the sale amount. Deductions are calculated using a table from the Land Department, which is based on how long you have held the property. If you (or your local wife/girlfriend) received the land from an inheritance, there is a standard deduction of 50%. Otherwise, the deductions are as follows: 92% if you have held the property for one year, 84% for two years, 77% for three years, 71% for four years, 65% for five years, 60% for six years, 55% for seven years, and finally reaching 50% for eight years or more. For example, if you have held the land for four years, the deduction is 71%. Therefore, if you sold the property for 1.25 million baht, you would be liable for tax on 362,500 baht. This taxable income is then divided by the number of years you held the property (divide 362,500 by 4 to get 90,625). The tax owed is then calculated from the standard personal income tax brackets (see the table at the end of this article). From the tax brackets, 90,625 baht is liable to tax of 531.25 baht. You then have to multiply by the number of years you held the property. Take 531.25 and multiply by 4 to get the final tax figure of 2,125 baht. It may seem a bit silly to divide, and then multiply by the number of years you held the property. However, this means that in the end you pay less tax, because a lower base is used for the tax bracket calculation. If this division and multiplication did not occur, in the example above you would have had to pay 27,250 baht in income tax at current rates. * For sale of inherited, non-commercial or non-investment property, the final tax figure must be no more than 20% of the sale price. * No matter how long you have held the property, the number of years you use in the division and multiplication process for the tax calculation cannot exceed 10. * The property is inherited or is an unsolicited gift, and is in a rural area, and the sale price is no more than 200,000 baht. * The property is given to your children, or is appropriated by the government. Buying and selling property can be a complex matter, and you should ask a lawyer for complete advice. It is a fact and it is reality that even as adults, we have to re-learn or re-think the basics from time to time. We get carried away by the fact that we are all grown-up and begin to masquerade the part of “being an adult”, rather than act and live the part. So many parents are intent on ensuring that their children develop into good human beings and in the process of doing this, forget themselves and their own need to review their development. We don’t suddenly reach an age and then stop learning. The learning process begins inside the womb and continues until the day we die. It is a rare opportunity we get to be able to take a look inside and to do a bit of self-examination. Whenever I hold self-development programs I remind the participants that they should look at this opportunity as a well-deserved break away from the frantic chaos of daily life, and a break that is going to provide them with the energy to re-charge the batteries and clear the cob-webs! The first thing that they learn to do is to empty their minds and to visualize the next few days as a blank piece of paper that is going to be coloured-in using fresh new crayons. An interesting and exciting thought and release for many, as they begin the process of self-assessment and discovery of who they really are and what they really want to get out of life. If this kind of program is something you are personally interested in and want to join, please let me know. The course runs for two days and is very intensive in so far as it is full of activities that provoke thought and action. It is highly interactive and requires everyone to participate to their fullest ability. Most people end up doing this and because they give it everything they’ve got - they gain so much benefit from the program! This form of program is a unique and powerful form of personal development training that has been the catalyst for many people, in many places, to strive for a much happier, more meaningful and more productive (successful) life. It covers issues such as trust and communication, builds self-esteem, self-confidence and self-worth in each individual. It focuses on inner strengths, qualities and abilities and explores self-awareness, human behaviour and attitudes. It looks at change, the need to change, and the way to make positive changes. It examines personal values and ideals close-up. It is a journey of discovery, of finding out about yourself and who you really are. It is a journey that will make you realize how important it is not to dwell in the past, but to move towards the future and to get on with your life. It helps you to understand more deeply why it is that you do the things that you do. It helps you to understand the significance of goals and why they are so essential to living life and wanting a better life. It is an adventure that allows you to see that you have tremendous abilities hidden inside you that you have not used and if you are able to bring them out and use them - you can achieve so much more. It is a profound experience that helps you feel the deep value of relationships with those around you, with your family and the ones you love. It helps you to understand the value and importance of your very own life! This program is for people of all ages, from all parts of society, from all backgrounds. It is for people of all nationalities, for people of all beliefs. It is for everyone who is looking for something more - for a life filled with purpose, achievement and above all - happiness. In many ways it is a giant wake-up call! Much of the content is familiar to all of us but we have, quite honestly, lost sight of the real issues and become lost in the activities of daily life so much so that it has not allowed us the breathing space we need - as human beings - to continue to grow. Many people who have participated in this style of program with me over the years still write to me today, staying in touch even with just a card to let me know how they are getting on with life. It is an extremely fulfilling part of my work and I am so delighted at the fact that they have made the effort. That speaks volumes! Snoring affects around 50% of the population at some stage in their lives, so you are not alone! What causes snoring? Simply, it is the tissues in the back of your throat vibrating as you breathe. Soft or loose tissue makes the possibility of snoring much more likely, as does the depth of your sleep. There are other factors involved in the snoring pattern as well. Lying on your back is one, as is going to bed with a skinful (nice non-medical term) of alcohol on board. Alcohol, as many men have found out, is a muscle relaxant, not the other way round. Unfortunately, as we get older, we are also more likely to snore as the muscles in your throat and soft palate lose some tension. Enlarged tonsils (those strawberry shaped glands in the back of your throat) can partially block the air passage and produce snoring as well. A blocked nose from any cause will also force you to sleep with your mouth open, and again you are more likely to snore. Even your uvula (the thing that hangs down like the clapper on a bell in the back of your throat) if it is large can predispose you towards snoring, so there’s lots of chances for you to become a rip-roaring snorer. Treatment? There’s no real specific medical treatment. Obviously lose weight and getting generally fit helps, and avoid the skinfuls! One old remedy was to sew a cotton reel on the back of your pyjama jacket - this was to stop you sleeping on your back, however there’s not too many people wearing PJ’s these days! I even read a medical article about 6 months ago that suggested all that was needed was for one’s bed partner to give you a kiss on the cheek. You can give this a clinical trial if you wish! Now while snoring can be a real pain for your bed partner, there is another condition which is much more serious called Sleep Apnoea (or Apnea if you are American). This is where you snort for a few minutes and then stop breathing altogether for 15-30 seconds, then restart breathing and snoring again in a repetitive cycle. Very often this wakes the patient up and in the morning they feel dreadful, having had a very poor night’s sleep. What has happened here is that the air passage relaxes so much that it closes over and stops the flow of oxygen and carbon dioxide builds up in the blood. This raised level alerts the brain to physically restart the breathing cycle, but unfortunately wakes the patient as well. So what can be done about this problem? Well first you have to do all the items that are indicated for snoring, and if that fixes the problem, that’s fine. However, the chances are that the problem will still be there. The treatments now are more physical. There is a special mask that can be worn, to push oxygen into the lungs. This is called Continuous Positive Airway Pressure (CPAP), and sufferers need to use the CPAP machine and mask for a long time. You may have to continue it for years! After CPAP there are various types of surgery that can be done to remove excess flabby tissue in the back of the throat. Again these are not fun, but may be the last resort. The doctors to see are respiratory physicians and be guided by them. I read all these long letters full of woe that you seem to get every week from yet another farang who has had his heart (and wallet) stolen by another girl of the night. They should just be more careful, that’s all. I have found the most wonderful, tall and good looking, perfectly groomed girl, her parents are both in good health and her grandparents are deceased. She has no children, and no brothers or sisters and from all reports, the buffalo is happily grazing. I am thinking of asking her to marry me. All it takes is a little looking and you can find the girl of your dreams in Thailand. Hillary is happy for you too, Petal. There’s only a couple of points that worry me just a little. This girl of your dreams, did you just dream her up, or is she real? And if she is, are you sure this is a “girl”? Check her passport immediately. Finally, before getting down on bended knee I would suggest getting the local vet to check the buffalo and furnish a report, witnessed by the local policeman, as long as he is not related. Is there an alternative to the unfriendly ‘song taew’ drivers in this city? I am so tired of their grunting when I ask them to take me somewhere, and it really is off putting not just for me, but for my overseas guests as well. What can be done, Hillary? It is not good for me at all. Yes, there is an easy alternative. It’s called “walking”. Now back to Noy’s response ... Now is the time for all us Thai lady to stand up against the never ending whinging, bitching and moaning the falangs sling at us, so let us look at the other side of the coins. We did not put a gun to your head in coming here. Just because you give us a few baht you own us? No way Jose. You say we get an Oscar for cheating and tell lie and say Hello Handsome Man and butterfly and sweet talk. OK we no angels, but all that is part of the package and if you don’t like it you lump it. Wise up handsome old man. So next time you see a young beautiful Thai lady walk down the soi’s with some old bald headed, pot bellied, technicolour rat tail with the roots dyed grey, consider you lucky because back home that lady would more likely be somebody’s grandmother. Finally all you ‘Goi’s’ in the sois, and including Ireland’s Caring Chris, put up or shut up. And Hillary, as one lady to another I hope you agree. I think you have very eloquently shown the “other side of the coins” as you put it. The “Handsome old men” of this world should all read and re-read your letter before coming over to Thailand and getting involved in this situation. You have beautifully illustrated the old adage - “You Get What You Pay For”. As Noy states, “OK we no angels” - you have all been warned! Camera Class: Good pictures - For One Shilling! I discovered an old book the other day, which I had written about a couple of years ago. It bears repeating. My old friend, Jan Olav Aamlid had left it for me. 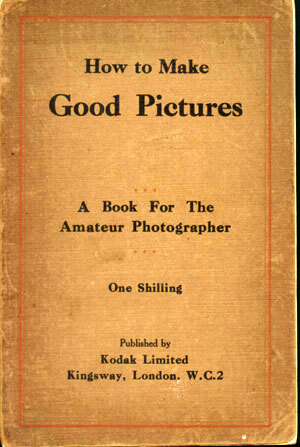 Called “How to make good pictures - a book for the amateur photographer” it had been published by Kodak in London, and cost one shilling! For one shilling you could buy a 170 glossy paged instruction book. Unfortunately there was no date in the book, but looking at the photographs printed in it, I would put the date at around 1920. Horse-drawn hansom cabs and bi-planes are certainly from another era. Further advice to the amateur with his flash powder and taper include, “If the room is darkened the sudden flash of light so strains the eyes of the sitters that it almost invariably gives them a staring look, but if the room is already illuminated by gas or electricity, the strain is not so great and the eyes will have a natural expression.” I would imagine that sitting in a closed room with some lunatic with crushed flash powder and a lit taper would make anyone stare a little! Yes, we certainly get it easy these days. There is one complete chapter on photographing interiors, with exposure times quoted around the 10 minute mark. They do caution, “The camera must be placed on a tripod or other rigid support for making time exposures. If time exposures are made with the camera held in the hands, the pictures will be blurred.” Now isn’t that the understatement of the year. The mind boggles at a hand-held 10 minute time exposure! However, it does have some very pertinent facts, still used today. With portrait photography, the book suggests, “As an example, take a young man with too prominent ears; it is obvious in this case that the full face would be displeasing, so turn the face slowly away from the light until the ear nearest the light disappears from the line of sight.” The book also says that if this still does not fix the problem, get the young man to rest his head on his hand and hide the appendages that way! But for me, the best part of the book was in the first few chapters where the basic principles of photography are explained in detail, even showing the differences between the difference in manufacture of lenses. Exposure control is well documented, and the amateur photographer who followed this book through to the end would have no longer been a true “amateur”. In those halcyon days, the budding photographer was also his own darkroom assistant and much of the book is devoted to D&P (Developing and Printing) and how to avoid the traps and pitfalls there-in. For those of you who have dabbled (or rather dipped and dunked) you will agree that it does give another dimension to picture taking, one that has all but disappeared these days, with the advent of the 1 hour auto-processor. No, it was a most interesting book, with some parts being decidedly “quaint” but others still as salient today. Thank you, Jan Olav. This is a Burmese curry. Being a “peasant” meal from India and the Shan states, the chicken pieces retained the bones, but fillet is best. I use pre-prepared as Kao Soi Seasoning Mix (Lobo), available at all major supermarkets. In the wok, heat 200 mls coconut milk and stir in the seasoning mix (low heat for 2 minutes). Increase to medium heat, add chicken thigh pieces and cook for 3 minutes. Now add rest of coconut milk, 600 mls of water, fish sauce, soy sauce, lemon juice and sugar. Lower heat and simmer for around 6 minutes. In a separate wok add oil and when hot add half the egg noodles and fry till crisp. This will not take long. Remove from the oil and allow to drain. In a small pot, add the remainder of the egg noodles to boiling water and boil for 2 minutes. Put equal portions of soft egg noodles into four bowls. Add the chicken and curry to each. Put fried noodles on top, then sprinkle on the onion, peanut and shallot. In this issue we are going to continue with our look at spam. Many people who responded to the last couple of columns about this issue have raised another area of concern that is addressed below. Spam is many things to many people. To some of us it’s the excessive number of junk e-mails we receive and what we can do about this. It is also something else we also have to deal with and that’s hype. Can we trust the claims made by some of these e-mails and web sites? Maybe it’s time to remember the door-to-door salesperson with the bag full of tricks. At least you could shut the door if there wasn’t a foot in the way. Scary or true? Be wary! Most of us think of hype as exaggerated or extravagant claims, especially in advertising or promotional material. Sometimes it is deceptive and sometimes even deliberately misleading. I think most of us have become a bit immune to this because of the constant exposure. But it always seems that someone, somewhere comes up with a fresh approach that is not immediately recognized. Con artists have been around since the beginning of time and are always willing to take advantage of another “hot prospect”. A little common sense should make sure you don’t fall prey to the new scams on the block. Let’s examine a few we get by email everyday. “Complimentary Vacation Package” - this one has been around a long time, but has now found its way into e-mail. It usually starts off with “Congratulations! You will be our guest in Orlando, Florida, home of Walt Disney World, for 4 days and 3 nights. All compliments of major Vacation Resort Developers.” Reading it, you might feel you have won a contest. In actuality, this is not the case. It is a high pressure sales campaign designed to sell you a “timeshare” vacation package. Another variation promises deeply discounted vacation packages. You pay for a package that seems great on the surface, but in reality is either third rate accommodations or doesn’t exist at all. “Guaranteed Winner” - they state - “You’re going to get one of these top five prizes, guaranteed!” In this scam you normally send some information by return email or fill out a form on a web site. You supply your telephone number to be eligible and lo and behold, a telemarketer calls you to confirm that you have been chosen for one of the five “valuable” prizes; however, you must pay a processing fee for handling, customs duties or taxes, and you must send a check or money order to them by overnight mail. If you actually receive a prize, its usually small trinkets of minimal value, or worthless discount coupons or vouchers. Or, you might receive an e-mail informing you that your order has been received and processed, and your credit card will be billed for the charges. The trouble is, you haven’t ordered anything. They contacted you using bulk email, using inactive return addresses which prevent you from refuting the orders by email. They do provide a telephone number in the area code 767, which is actually in the West Indies. They try to keep callers on the line as long as possible, and you are reportedly billed as much as $25 per minute. Be aware that your local telephone company will bill for any Thai Telephone services provided. Another current scam offers you a cut of stolen money from Nigeria that was stolen and they need your help getting the money out of the country. They of course want a cut of the money that they claim will be wired to your personal bank account. You of course are expected to pay them their share up front. The money, however, never arrives in your bank. This is just a variation of the Nigeria Scam which I am sure you already know about. You do, don’t you? One group sends hundreds of thousands of unsolicited emails to people directing them to web sites promoting the Mega$Nets and MegaResource programs. When you visit one of their web sites you can download copies of the software program which contains a list of five names and addresses. The software program and web sites direct you to send twenty dollars to each of five people listed in the software in order for you to get yourself placed at the top of the list of names. A variation of this one is the 15 year old boy, who’s mother found $70,000 in his bedroom one day. This is simply the old fashioned chain letter. Actually, there are a lot of chain letters floating about the web and all should be avoided. Another email promises guaranteed Credit Card approval! One group offered Visa cards to the credit-challenged “to put you back in the mainstream of financial life in high style” at an interest rate of only 4.9%. How? Through the magic of using offshore banks in tax haven countries. There is, however, a $100 processing fee and $25 per month charge regardless of use. The latest scam I personally received was from UK Lotto International telling me that I was a Category B Winner and so long as I contact the sender within 1 week, I could collect a considerable amount of Sterling. The e-mail included a detailed explanation of how the sender made their cut of the proceeds. A look at the real UK International Lottery Web Site immediately exposed the scam with an exact copy of the e-mail I received warning that this was a hoax. Sad but true, so no, I didn’t win a penny. But then the good side is I didn’t lose my arm and a leg too. There is simply no way to adequately cover all the scams that are around at this time. So before jumping into any of these “make a million while you sleep” plans, use a little “due diligence” and check them out. The money you save will be your own.